“News, Nuggets, and Insights” reaches a milestone; it’s 100th program! We are excited to share a look back at our humble beginnings and the progress made in our outreach for The Church of God, Ministries Int’l. This week we focus on something revolutionary among the churches of God. 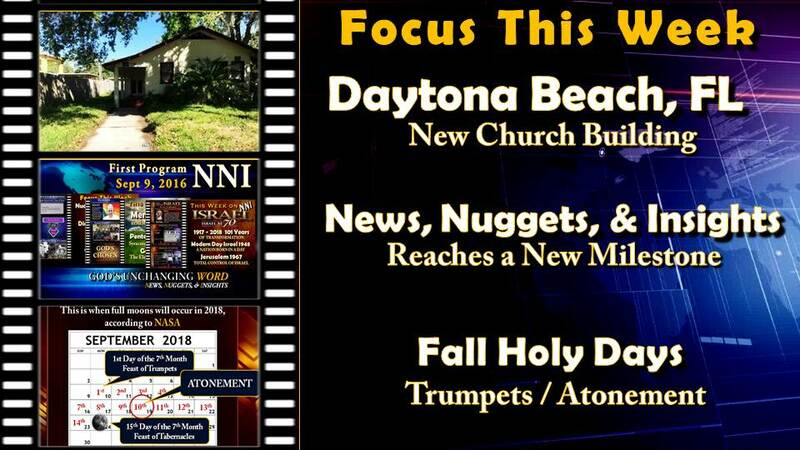 Join us as Tom Kerry shares exciting news about our Daytona Beach, FL church building, and a very interesting concept to help the field churches. Is there a better way to fulfill the church’s responsibility to Christ to feed his sheep and make disciples? As God’s churches strive to grow, Satan is always there seeking to devour them. God’s churches have lost many of their assets to pagan churches. It seems the spiritual sojourner was lurking in the shadows just waiting for the right time to overtake what the churches had amassed. Why did this happen? This week we take a look at examples in our past and in scriptures that help us understand what it is we can do prevent this tragic ending for our church. The Fall Holy Days are just weeks away and this week we begin our study on the Day of Atonement. Tom Kerry also answers the question he proposed last week about the meaning of the Feast of Trumpets. This week we have sent out 4 DVDs. 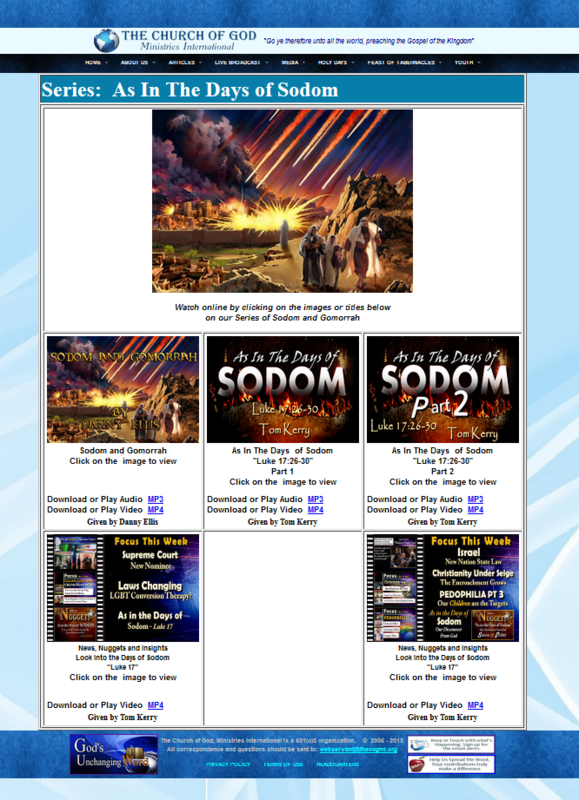 “NNI – As in the Days of Sodom PT 1 & 2,” “Sodom & Gomorrah” by Danny Ellis, and “No Room for the Enemy” by Chuck Hunt. Thank you for your prayers and your support in helping to promote our program. We couldn’t have celebrated our 100th program without you! Please continue to share these emails and information with others. We look forward to next week as we continue our study on the Day of Atonement and the fast approaching Fall Holy Days. here is our link to the Sermons and NNI on "As In The Days of Sodom"
Click on the Image above to view this powerful Sermon Series.